Thanks your letter of Nov.24th. Glad you had a lovely time during your stay in L.A. but I imagine you were happy to get back home again. Eda joins in every good wish to you all - hope you'll visit us again on your next trip South. On election day, two birds sitting on a telegraph wire and chatting. 1ST BIRD: who are you voting for? 2ND BIRD: I guess I should go for Nixon, everybody seems to think he’s for us! Sorry delay in acknowledging yours of Nov.15th. Reason is, I've been busy trying to figure out this gag: 'NO MATTER HOW LONG YOUR STOCKING IS, THE TOP IS ALWAYS NEAR THE BOTTOM'.!! - sounds dirty to me.! I read that 'Bally Aches' was insured for a million Dollars & had been paid to the owners - (I wonder what the poor are doing? ), can you imagine getting all this money after all they already made on it? The good Lord certainly did'nt smile on them - HE LAUGHED OUT LOUD.!! Thats nice that Lincoln's wife is charming towards you, am sure you must be very happy. On election day, two birds sitting on a telegraph wire & chatting. 1ST BIRD: who are you voting for? 2nd Bird. I guess I should go for Nixon, everybody seems to think he's for us.!! Bye now. Eda joins in wishing you a very Merry Yuletide, lots of good luck & happiness in the New Year. Thanks your welcome letter of the 5th.inst. so sorry to hear the bad news about the resturant, certainly hope the damage was fully covered by insurance - too bad it had to happen so near the Xmas holidays, especially having so many banquets lined up. Well,fortunately no lives were lost, maybe it was lucky it happened on your closing day, it could have been a tragic affair. Please convey my regrets to youre father. I can imagine him being sick about it all, well, wish him better luck on his new building, am sure he'll make lots of new improvements & will turn out for the best. Note you met Johnny Mack Brown & Ray Hatton in the Hollywood Parade - I thought Ray was living in San Diego, I have'nt seen him for a long time, I never meet Johnny Mack Brown or Buck Jones, I too heard that Buck was a very nice person. Getting back to the fire, I got a laugh over the fireman being blown out of the window into the pool - reminded me of L&H!! You say if the pool had'nt been there, he'd have got hurt - how about if there'd been no window!! 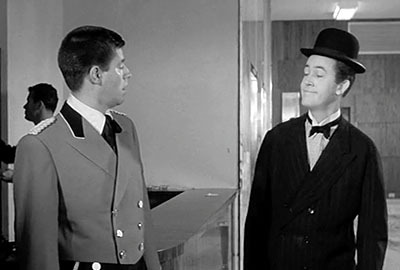 When I talk with Rand Brooks again, I'll tell him that you have a print of the film he appeared in with Bill Boy. I have'nt heard from Rand for some time now, do'nt know exactly what he's doing these days, but I understand he manages to keep busy in most of the series on TV. Maybe you could drop him a line & arrange a date to see him sometime at his home - tell him you're a friend of mine. His address is: Rand Brooks,5329,Tampa Avenue.Tarzana.Calif. All for now Lee, take care of yourself. Mrs Laurel, joins in wishing you a very Merry Yuletide, Lots of good health & a happy prosperous new year. Thanks Phil [Shannon] for the nice Xmas Greeting Card. I appreciated very much your kind remembrance. I too mish you a very Merry Yuletide, lots of good health & happiness in the New Year. Eda will have a lipstick sent to you sometime next week. It may not arrive right on time, but do'nt worry. Hope you heard from May Black. Eda joins in love & bestest & wish you a very Happy Yuletide,lots of good health & happiness in the New Year - please convey same to Dolly. Bye Dear. Good luck & God Bless. Thanks Bob [Board] for the kind remembrance. Eda joins too in wishing you a very Merry Yuletide, lots of good health & a Happy Prosperous New Year. Thank you [Dean Kaner] for your nice letter - nice to hear from you again & to know alls well with you. Hope you will enjoy appearing in the school play, lots of success. Wish you & your family a very Merry Xmas, lots of good health & happiness in the New [Year]. 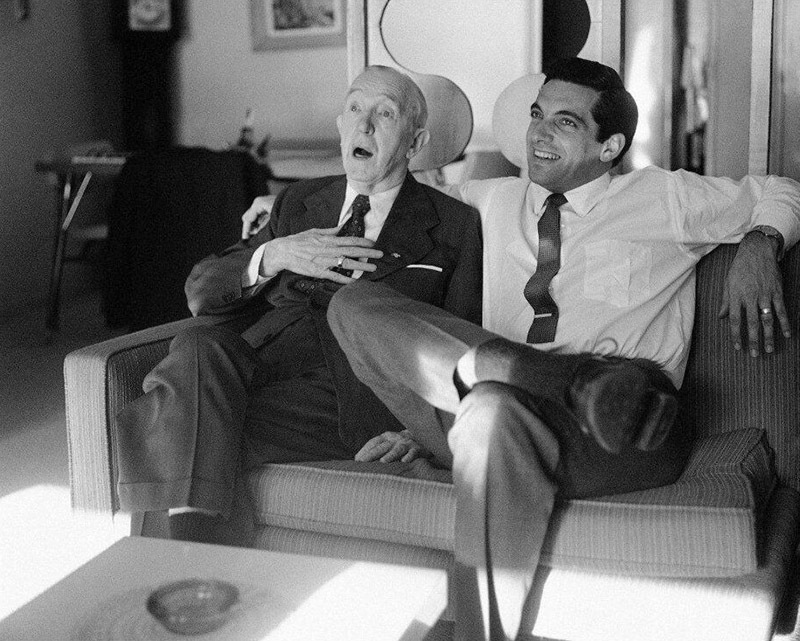 Stan Laurel, left, of the noted comedy team of Laurel and Hardy, was photographed with Frankie Vaughan, British actor-singer, at the Laurel home. The picture was taken when the 70-year-old Laurel, who was born in England, recently entertained Vaughan at the Laurel home. Sorry I have no Laurel and Hardy souvenirs, otherwise it would have been my pleasure to send you something for display. Herewith is the photograph you requested me to autograph. Sorry I have no L&H souvenirs, bowlers, etc. otherwise it would have been my pleasure to send you something for display in your museum. However, am enclosing a couple of stills which were sent me recently from Paris, France, they may be of some interest to your patrons - it may interest you to know that L&H still have greater popularity Abroad than they ever had in the U.S.A. Wish you a very Merry Yuletide & a successful New Year. Thanks Gary [Arnold] for the nice card. I too again wish you all a very Merry Yuletide, lots of good health, success & Happiness in the New Year. Thanks Charlie [Thompson] for the nice card & kind remembrance - much appreciated. I too wish you a very Merry Yuletide, lots of good health & happiness & a Prosperous New Year. Thank you Mrs Saliminen, for the kind remembrance. I too wish you a very Merry Yuletide, lots of good health & happiness in the New Year. Many thanks for the lovely card and handkerchiefs, We appreciated very much your sweet thoughtful and kind gesture - Eda joins in many thanks, & too, wish you a very Merry Yuletide, lots of good health and happiness in '61. No, I haven't been busy on the Cartoon idea, the deal is still in negotiation, if it does materialize, I won't to be active in the production end, my only interest concerned will be the Royalties on each film shown. I may of course be called on for suggestions occasionally, which naturally I shall be happy to help in any way. We have a deal under-way with the New York TV producer David Susskind, he produces shows for the Dupont Co. 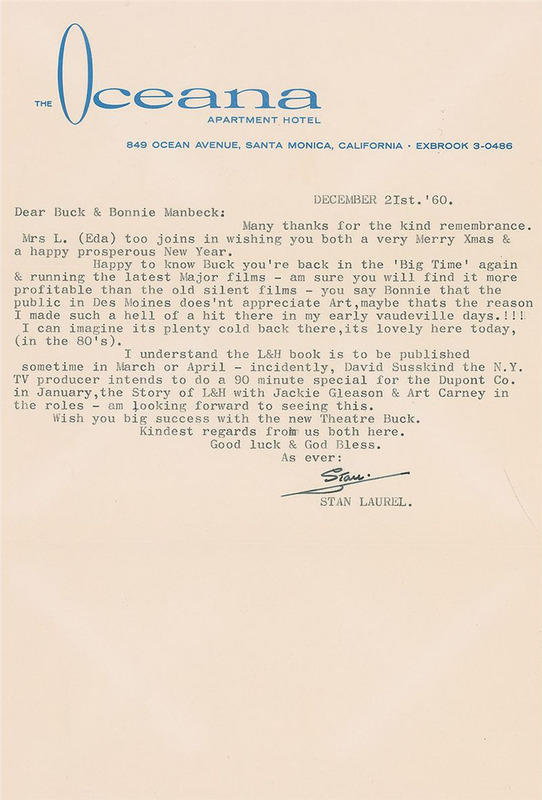 He expects to produce a story of L&H, a 90 minute Special, sometime in January '61. with Jackie Gleason and Art Carney as L&H. I will let you know more about it later (date of showing etc.) It should be very interesting. Note Ethel and Pete Wright will be spending Xmas with you, please convey our regards and best, also Season's greetings. A friend of mine from London, visited me last Oct. & brought me quite a few old English records, some dating back to the 1900's popular songs sung by Marie Lloyd, Florrie Ford, Geo Lashwood etc. such as "She's a Lassie From Lancashire" "Shine on Harvest Moon" "Lily of Laguna" etc.etc. Am wondering if it would be possible to borrow a tape recorder among your friends, I would like to put these records on tape for you - I would send you the records, but I know they would get broken or bent - don't want to take any chances. Let me know & I'll make some copies for you. I know you'll really enjoy listening to them again. Not much exciting to tell you Ivy, so bye for now. Remember us kindly to Mr S. hope he is feeling much better. I got a big kick out of the Old Gold Advertisement. We look like a couple of teenagers! David Susskind, the N.Y. TV producer is contemplating a 90 minute special show next January for the Dupont Co. The L&H story with Jackie Gleason & Art Carney the deal hasn't been finalized as yet but looks very promising depends if Dupont Co. OKs the story script. I got a big kick out of the Old Gold Adv. I think that was used in 1929 first time I saw this display card, we look like a couple of teen-agers!! You certainly had some bad snow storms back there & was'nt that Air disaster in New York shocking, what a tragedy a sad Xmas for all those relatives I imagine a lot of people will be cancelling their Air travel this season. Note you are now interested in a Tape recorder mine is a 'Wollensack' small portable, (model T 1500) its a pretty reliable machine, but I think the 'Telefunken' product is far superior may cost a little more. but really worth it. You'd get a lot of pleasure out of one Earl, the operation is very simple. you soon catch on. If you do decide to get one, I shall be happy to send you some copies of my collection of disc records. 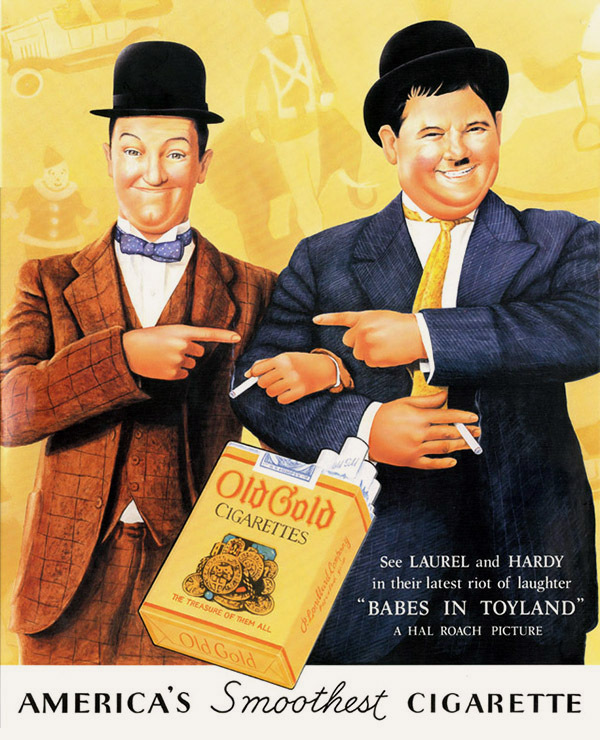 Old Gold was a brand of cigarettes marketed by the Lorillard Tobacco Company. Babes in Toyland was released on March 10, 1934. Thank you Clifford for the kind remembrance. 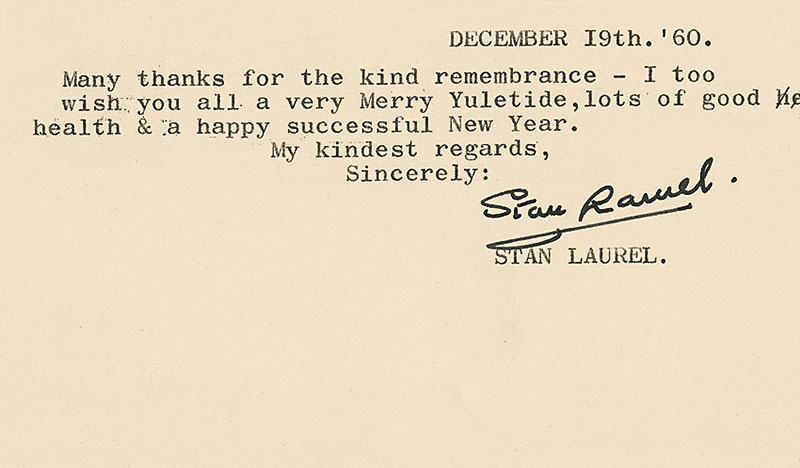 I too wish you a very Merry Yuletide, lots of good health & happiness in '61. Mrs Laurel joins in wishing you & yours a very Merry Yuletide, lot of good health & a Happy Successful New Year. Many thanks for the nice card - appreciated the kind remembrance. 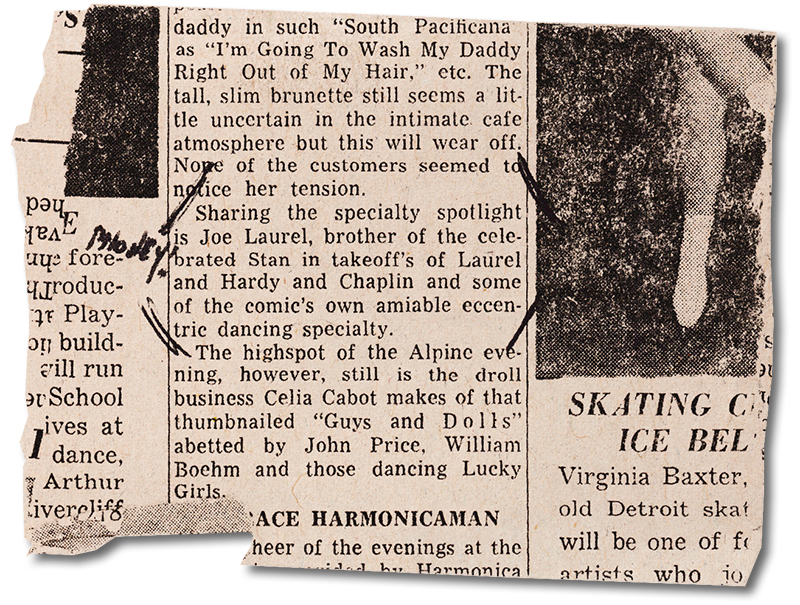 Re the clipping concerning Senor Joe Laurel - I have heard of him from several people, he's been posing as my Brother for sometime now, which of course is definitely phoney - I did have two Brothers, but they both died many years ago - maybe this guy is an illegitimate member of the family.!! Delighted to hear you will soon he headin' for Australia, sincerely wish you lots of success Frank, I know you will enjoy the experience 'Down Under', I have several friends in Sydney & Melbourne. I imagine you will be playing at one of the J.C. WILLIAMSON theatres. Mrs L. joins in wishing you a very Merry Xmas Frank, lots of good health & happiness in '61. Good luck & Bon Voyage. Many thanks for your sweet thought Marie. The package arrived safely, & much appreciated - only sorry I am unable to taste the cookies, but rest assured Eda will enjoy them very much - I saw a glint in her good eye.! The box is very attractive, & I know we shall have good use for it. We wish you all a very Merry Xmas, lots of good health, & a Happy & prosperous new Year. Our kind thoughts to you both & Mother. Many thanks [John Perrie] for the kind remembrance - I too wish you all a very Merry Yuletide, lots of good health & a happy successful New Year. Many thanks for the cute card, appreciated very much your kind remembrance - it was quite a surprise to see the snapshot of ourselves - can't think when and where it was taken! anyway, thought it turned out very good. Mrs L (Eda) too joins in wishing you both a very Merry Yuletide, lots of good health & happiness in the New Year. Many thanks for the kind remembrance. Mrs L. (Eda) too joins in wishing you both a very Merry Xmas & a happy prosperous New Year. Happy to know Buck you're back in the 'Big Time' again & running the latest Major films - am sure you will find it more profitable than the old silent films - you say Bonnie that the public in Des Moines does'nt appreciate Art, maybe thats the reason I made such a hell of a hit there in my early vaudeville days.!!! I can imagine its plenty cold back there, its lovely here today, (in the 80's). I understand the L&H book is to be published sometime in March or April - incidentally, David Susskind the N.Y. TV producer intends to do a 90 minute special for the Dumont Co. in January, the Story of L&H with Jackie Gleason & Art Carney in the roles - am looking forward to seeing this. Thank you [Louise Williams] for the nice card - appreciated the kind remembrance. I too wish you a belated Merry Xmas, lots of good health & a happy successful New Year. Thank you [Ilmija Laivins] for the kind remembrance. Wish you lots of good health & a happy successful New Year. Thanks [John Virzi] for the kind remembrance. Wish you lots of good health & a happy successful New Year. Thanks [Leo Schimmelpfennig] for the kind remembrance. Wish you lots of good health & a happy successful New Year. Jerry Lewis’ drummer, Bill Richmond, has traded his sticks for a typewriter and now pounds out jokes instead of music. Before backing up Jerry in the band, Bill played with such top orchestra leaders as Les Brown, Harry James and Nelson Riddle. ““Writing has always been in the back of my mind,” Bill said. “Jerry and I used to talk over bits and parts for his TV shows, so when he started making ‘The Ladies Man’ he gave me my first real writing assignment. Richmond said it’s not unusual for a Hollywood musician to turn script writer, “I don’t know what the relationship is,” he said, “but a lot of musicians work in pictures and TV shows. Some guys sit around and read books but I always watched what was going on. The 38-year-old Richmond is concentrating on comedy and has signed a contract to work in Lewis’ productions. 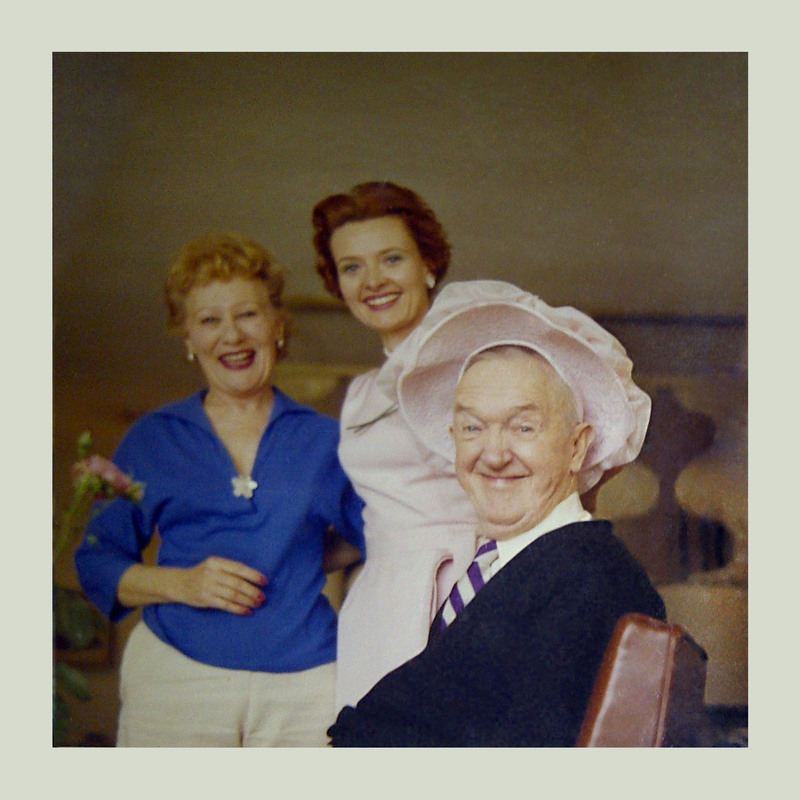 Richmond is doing background research for his writing and studies the work of one of Hollywood’s greatest comedy teams, Stan Laurel and the late Oliver Hardy. For his initial writing assignment, Richmond gets ideas by watching Jerry’s offstage antics.